We clean a whole array of various Commercial Properties including Offices, Schools, Hotels, Car Showrooms, Hospitals, Retirement Villages, Warehouses, Shops, Doctors Surgery’s, you name it, and we clean it! We like to tailor our service to your needs so we are available for a one-off window cleaning as well as longer-term maintenance contracts. We can work around a schedule to make sure that we minimise any disruption that might be caused by our commercial cleaning services. Whether it is a regular scheduled service or a one off job to meet a required deadline, OneClean have the team to meet your requirements. 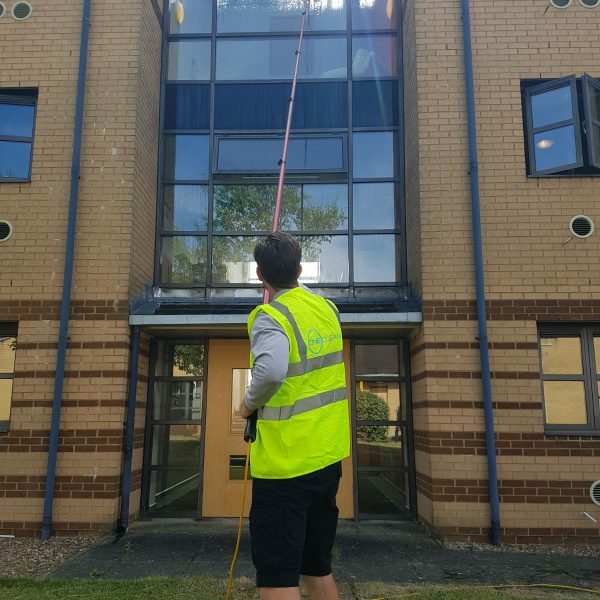 Our friendly team are experienced using traditional squeegee methods, reach and wash pole, cherry pickers and cradles which is why we are the leading commercial window cleaners in Milton Keynes, Bedford and Northampton. Our dedicated office team are always on hand to help and enable OneClean to react promptly to any emergency call outs.